What are the best countries for a passionate birder to move to? And why? I discovered this map a while ago, hidden somewhere at the not so easy to navigate BirdLife International’s website, and I have used it as my computer wallpaper ever since. Usually, I interchange some birdy wallpapers several times per month, but this one has stayed for several months already. It makes me think what is the meaning of life, the universe and everything? Why am I here? And where all those birds are? 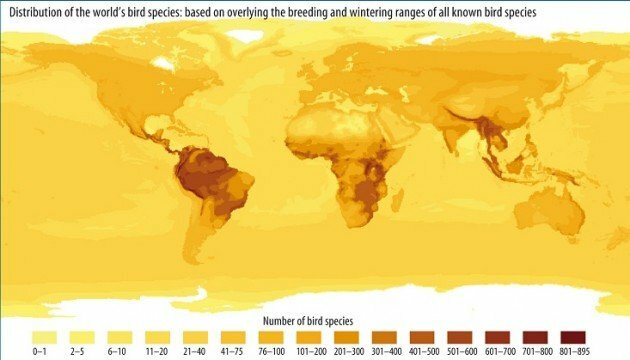 This map shows the distribution of the World’s bird species, based on overlying the breeding and wintering ranges of all known species. And it raises a question: if all the birds are having a party over there, am I in the wrong spot? I live in the southeast of Europe, for a while lived in the south of Africa and also have extensively birded western and central India. With a few more excursions here and there, that is about it. And, sadly, haven’t even reached one thousand birds on my life list, yet. I used to live in Botswana, where there are about 450 bird species in an area a few dozen miles from the capital; then somewhat naively moved back to Serbia with mere 250 species around the capital. And it shows. Birding by canoe in Botswana brings 60 birds in two hours (I am not even talking of the Okavango, but the southeast of the country), while two hour paddling in Serbia brings half of that number. Several years ago, my best friend / canoeing partner suddenly died and that pushed me into a mid-life crisis. I started reevaluating my life (list), the universe and everything. And I remembered that, back when I was a boy, I wanted to live in eastern Africa. Or Polynesia. Or Wild West – I could not decide. Without the time travel, the last one drops off the list. And a mere 120 bird species would be a good reason not to take Polynesia as an option. Which leaves only East Africa. But I am now a grown up and should not be so narrow minded. Basically, evaluating the countries I might move to for a longer period, I reached three criteria. Here where I live – in one of the bird-richest corners of Europe, but I miss the species diversity of my yester years. So, the perfect country to move to needs to have at least twice as many species as Serbia. I am talking 600 or 700+ bird species. Secondly, I lived under a bright sunny sky in Africa for several years, then moved back to murky sky of Europe in December and didn’t see the Sun for the next three months. Perhaps I could live without it, but why would I want to? And finally, the chill factor. While I do enjoy the first snow of the season, the second snow is a different matter. As is every one after it. So, beside a lot of birds and the sunny sky, I want the coldest thing to experience year-round to be my beer. Which leaves me with quite a few choices – practically the entire tropical belt, right? 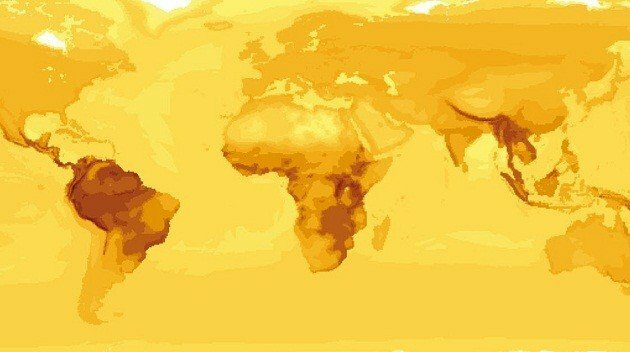 Out of almost 200 countries of the World, more than 100 are in the tropics. Many of them are heavenly islands, alas, with 100 or less bird species. Write off. Some regions are politically unstable, e.g. most of Central and Western Africa. Scratched from the list. Also, I can’t speak Spanish or Portuguese, so the countries where English is commonly spoken would be somewhat higher on my list of choices. I am thinking of a relatively stable/prosperous bird-paradise where one may be able to find a job in ecotourism or wildlife research… or, to begin with, as a resident environmental scientist / nature blogger in some wildlife lodge? While there is a lot left to be done when it comes to research and nature protection in many tropical countries, there are not that many jobs in that line of work, and ecotourism seem to be the industry of choice. And here I reach the question: where should a budget-conscious middle-aged experienced environmentalist who wants to be involved in ecotourism development or wildlife research / spend evenings watching sunsets with a beer in his hand, move to? Here are 15 countries (+2) I am considering – do you have any suggestion, idea, recommendation or advice? Which countries would you consider and why? Which may be better avoided and why? Every country is followed by the number of bird species recorded in it. The first figure comes from the BirdLife International – in some cases, these seem to be seriously outdated. Hence I added the second figure from the Fat Birder – often more up to date. Taking as a rule, the higher figure is more accurate. I vote for Botswana again. Stable government. Near enough to Joburg if you need a city. Same time zone as home, should you want to go back occasionally. I’m just not a fan of the very high bird count Latin countries and India is too crowded. Just one person’s opinion. Well, the north of Botswana for sure. I know of one Big Day attempt by the same guide who guided Bill Clinton around, to reach 300 species in a day. He was just a few species short of his goal, but it is an old story and it may be possible that the 300/day has been reached by now. Yes, Botswana is an exceptional country by many standards. I do not know of Latin countries, but in India I spent days in deserts and jungles where there was hardly anyone – or the usual herds of tourists in tiger reserves. But those tourists do give me a lot of hope that tigers will thrive there. Why? Unlike Africa, where the reserve visitors are mostly white (a minority of population) and often expats (read: foreigners), those tourists in India are predominantly locals. They are excited about their wildlife, they care for it. And they hold the key of its survival. I can speak from personal experience about India! I came to south India, hoping for some great experience with a conservation-focused NGO, as well as finding new birds to cross off my list! It’s been a frustrating couple of years, with few responses from NGOs and very little opportunities. Really good birding spots are hard to find. But it could just be where I live. India is a big country, and I’m sure there are some great NGOs and birding spots somewhere in here! But the best piece of advice I got was from one really great Indian guy who lives in Kansas and whom I met in Gujarat. He told me: “Without spice, there is no life.” We were talking of Indian cuisine, but I like to see a broader meaning in it, reflecting on life, the universe and everything. After the northeast, especially the lower slopes of the Himalayas, the bird richest area of India is the Western Ghats range (including Kerala), but how easy or hard it is to get to those places, I do not know. Some reserves of Gujarat and Maharashtra I visited by 2×4 SUV and it worked without any problem. But it helps to get to know the areas and the locals in advance. Thank you for this fascinating post! Of course you need to factor in the political situation in each country, and some have rather sad stories. I’ve heard Panama is a nice place to live and has great birding, but don’t see it on your list. For a vacation? After seeing your list, I think I’ll plan a trip to Peru! Peru? Then, Manu Reserve is the place to go. Don’t know much about Panama (which is just the other way of saying I know nothing on Panama), but at some FB groups, Venezuela was commented as “was bad and getting worse” and Trinidad, Belize and Guyana suggested instead. And of those three, I already have the Guyana Bradt travel guide on my shelf (they produce my favourite travel guides and pay a lot of attention to wildlife and nature travels). Regarding politics, for many of these countries the Foreign Office has issued a yellow warning (stay away from some parts of the country), but there is not a single red warning (don’t go) country in the list. You may know Derek Kverno’s blogs, but I’ll copy his Ecuador blog here: http://birdingecuador.blogspot.ca/ It can certainly whet the appetite. It was invaluable to us when spending a winter in Ecuador. Ecuador has considerable appeal with its varied geography and huge bird count. Kverno also has blogs for Brazil and Tanzania. We ( two Canadians escaping said snow) have spent winters in Thailand, Panama, Costa Rica, Ecuador and Mexico. Mexico was by far the most exciting country. Culturally and geographically, it would be hard to match and it does have around 1000 species, although distributed over a large area. Most Latin Americans do not speak English much, but there are large expat communities throughout Mexico, Costa Rica, Panama and Ecuador. We liked the Ojochal area in Costa Rica, the Yucatan area around Merida, the Volcan area in Panama, and the Otavalo area north of Quito. I was actually thinking of Mexico first, but since the only news from that country that reach Europe are of cartel wars, I listed Costa Rica instead. I met a Finish bird guide once and he had a great idea. The short northern summer he spends chasing owls in boreal forests of his homeland, but the long and harsh northern winter he spends guiding in Bali. As crowded and humid as it could be, it still sounds like a dream to me. OK. so it’s a bit fewer species than you prefer, but I would suggest northeastern Turkey — because that’s pretty close to Georgia, where you would definitely not want to be for stability reasons, but where the latitude and longitude are both 42, which I gather is secretly important to you. Well, the best parts of Turkey are in the south and the southeast, towards Syria… which unfortunately may not be the best choice these days. Thousands of Syrian refugees are nowadays passing through Belgrade (where I reside) every day, hoping to reach the EU, which is hurriedly building a 4 metres tall wire fence at its Hungarian border. But talking of such places, close to some particular coordinates, 🙂 , there is one other place that intrigues me more. Nestling in the humid armpit of Africa, it has staggering 26 endemics but, alas, only 144 bird species – the Sao Tome and Principe islands. And the coordinates? That is the closest place on Earth to the 0 – 0 point, just slightly to the northeast of it. I started birding outside the US, but I still haven’t had the desire to live life as an expat. That said, if I were to try it for real, I’d be in Ecuador in a heartbeat. For myself, I need warmer weather… and sun. Back in the middle 90s, 20-21 years ago, I spent six months in Alaska. I actually thought I could deal with the cold, but not without the sun. And by mid-September watching thousands of shorebirds and waterfowl begin to stage got me wondering… aren’t they the smart ones to vacate this place at this time of year. I did move to SE AZ to have my minute to minute bird fix, but it’s a base so I travel and return and try and be content – that’s my balance. But that doesn’t fully quell dreams of Ecuador… or New Zealand. The latter country I love but feel climate-wise is too far on the cool side – damn Southern Oceans! Well, that is the case with those huge countries like the US – you can move very far from home but still remain within the US borders, having an entirely different set of birds and yet, all the benefits of home. Travelling, yes… This spring I had one good birding weekend each month and that kept me going, but some faraway place, a trip to another continent, that can quench my thirst for the next 6-12 months. The first thing I would want to do is visit as many of those countries as possible to get a feel for them; then I would move to Mindo, Ecuador, or St.Lucia, South Africa. You cannot beat those places, lots of ex-pats to sovialize with. St. Lucia, yes… a good one. And, John – just love your paintings! I’d suggest Malaysia. My reasoning is that Kuala Lumpur is the home of Air Asia, which has dirt cheap flights to nearby cities and beyond. Fancy a weekend of birding in Cebu, in the Philipines? Your’s for 100 bucks (or less if you are clever). So not only do you get your 700 species in the country but cheap and easy access to nearby places like Indonesia, Cambodia, Indonesia and Thailand. Sounds great. Besides reading of wildlife watching in the peninsula, but also Borneo (that name has some magic surrounding it, a place of childhood dreams), I also understood that Malaysia is striving to reach very high conservation standards set by its neighbour Singapore? Which translates as more wildlife-related jobs? Hey all, this year has been my first samplin of SE Asia. I stayed in Kuala Lumpur for a while (great coffee, no birds), managed one trip to Fraser’s Hill-fantastic! I did a short trip to DoI Inthanon in Thailand-likewise fantastic (had a Slaty legged Crake doing photo ops for 3 hours!) This year I’m going back for the birds. Thailand and Malaysia are relatively small easy to get around with hotspots galore. I would like suggestions for specific towns/ cities to live in in Asia and South/central America that have great birds, decent air quality and decent internet and amenities. Ron – as the NZ writer for this site I should note that NZ has great endemisim but low diversity. Day to day I rarely see surprising things. Leaves you longing for woodpeckers and crows. It’s a great place for birds but if you are after numbers I’d suggest Oz. Australia does seem to tick all your boxes, but you need a “stubby holder” for your beer, or it will get warm too fast! Yes, toads, toads… but where the birds are? Which areas have the longest bird list? You do know of my crocodile safari, do you? 100 on day one? Envious! I received your Facebook message while in Queen Elizabeth National Park (625 species) and I thought the link was of an article you found online. Now that I can open it, I see that I can get some personal background of yours quite easily. Provided you have any inclination to share your vast knowledge and deep passion with the people of southwestern Uganda, the Gorilla Highlands should be your destination really… We are a loose partnership of lodges and other tourism and development organisations eager to build up our birding capacity. 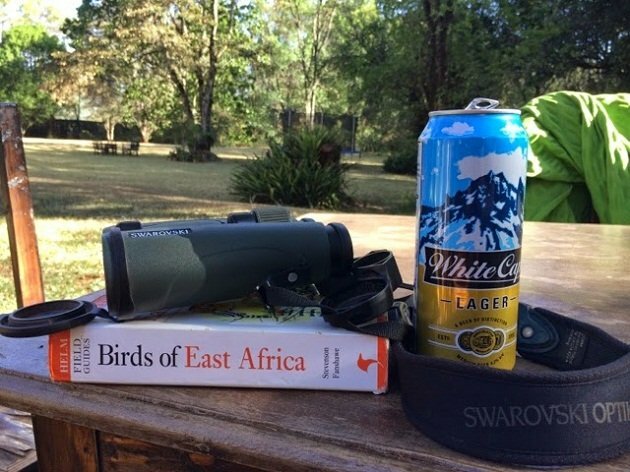 Our bird variety is immense but bird guides actually based in our region are ridiculously few. In addition to training of local guides there is another important potential work area. I am about to start the Gorilla Highlands News blog that would greatly benefit from your input. In Botswana, I met an Italian who used to live in Uganda and he described it as lush, green – two yields per year… Something to think about indeed. Also, since I’ve seen this comment of yours, I’ve pulled out my Bradt Uganda travel guide 🙂 it’s on my desk as I type. Will get back to you with more details in pvt. I worked 2 years in Tanzania and would return if I had a chance! Great birds, great people and fantastic nature all over! Jungle, savannah, beach, montane forests, miombo forest they have it all! So many choices, so few years! Dont forget UK 581 species ?